Cue the collective groan: Monday, March, 4 marked the start of street sweeping season. The D.C. Department of Public Works promises to only give warnings through Friday, March 8. 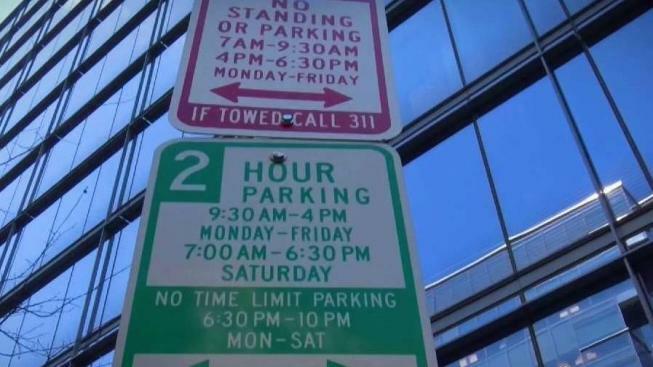 After that, pay close attention to D.C.'s notoriously confusing street signs — Or pay the price. If you received one (or more) of the tens of thousands of $45 tickets doled out annually, you might want to try something new: An app that reminds you to move your car. MyDPW DC will remind you when street sweeping will take place on streets you select, helping you remember where and when you can't park. Here's how it works: After downloading the app to your Apple or Android device, you will be prompted to register for an account. Once you're registered, you can put in the address of your work, home, daycare or another place you park frequently. The app will automatically select the nearest relevant street, and you can choose from other nearby streets off a map. When street cleaning time rolls around, you'll get an alert. The app even allows you to keep tabs on multiple parking areas and sign up for text notifications. "With this new app, we hope to lessen the burden on those who park on residential streets and decrease the number of vehicles our street sweepers need to maneuver around," said Acting DPW Director Chris Geldart. Generally, you're barred from parking on certain streets during days posted on red and white signs. Street sweeping lasts until October. The app also allows you to get leaf collection notifications or input your license plate number so you get an alert if your car is ever booted or towed.